Hello my lovelies! So, as you might be able to tell from my blog post title and my little banner up there, my blog was nominated for a Liebster Award! The lovely and superbly sweet Tashia, a fellow beauty blogger and Instagram pal nominated me. You can find her blog at allthingstashia.wordpress.com. I love that her blog is full of great information, but she can also be pretty darn blunt! Check out her post "To Dupe or Not to Dupe" and you'll see what I mean! One of my favorite posts of hers! Thank you for nominating me Tashia, and for all of the support you've always shown me. If you don't know about the Liebster Award, it's probably because you're a newbie blogger, just like me! In a nutshell, the Liebster Award helps to introduce smaller and newer blogs to a wider audience. It is also a great way to meet and network with other bloggers who share the same interests as you. The Liebster Award is not a type of competition where people vote for your blog, nor do you attend some fancy event somewhere to receive a special plaque or a trophy. What the Liebster Award really is, and what you make of it, is purely up to you. Many see it as a blogger's "chain letter" and an annoyance. It is you and you alone that chooses whether or not to accept the nomination and do the work involved and post. I'm having a blast with it! I think these posts are fun because you get a chance to see how people answer the questions posed to them and the types of questions they pose to their nominees! There's no official "Liebster Award" website and I've seen so many versions of the "rules" that I'm pretty much following the ones that Tashia wrote on her blog. Here are the rules (I just copied them directly from Tashia's blog...so credit to Tashia!) And, I think at some point everyone has broken the "rules" with the number of people the nominate, or follower numbers, so don't stress about it! 2. Answer the 10 questions which are given to you by the person who nominated you. 3. Nominate up to 10 other bloggers you like and who have less than 200 followers. 5. Let them know that they have been nominated by going to their blog and notifying them. Do you prefer lipstick or lipgloss? Lipgloss...it's usually easier for me. What's the biggest beauty splurge you ever made? My Estée Lauder skincare regimen. What's your best beauty tip? Drink tons of water everyday. If you can do it, drink only water on a daily basis. What's one beauty purchase you regret? My most recent foundation purchase, the MAC Prolongwear. It broke me out horribly. Do you wear only one type of mascara at a time or do you layer multiple ones? I layer. One coat of waterproof to hold the curl, and then whatever else strikes my fancy that day. What is your favorite beauty/fashion magazine? I don't have one. What is one beauty item that is under hyped in the beauty community? In my collection, it would have to be the elf Studio Eyebrow Kit. If you could only buy one beauty brand for the rest of your life, which company would you choose? (Thanks for the toughest question EVER Tashia!) I'm going to have to say Estée Lauder just because I love the skincare and the Double Wear foundation. I own one eyeshadow and one lipstick from their line, and I like both, so I'm sure I would like the rest of the line well enough to only buy their products. Is there any other hobby or something that you love that you considered blogging about? If you could choose only one, which would it be? Mascara or lipstick? Would you wear false lashes on a daily basis? Or special occasions only? Or never? What part of your daily makeup routine do you hate doing the most? Foundation application: Brush, Beauty Blender or fingers? Do you have a favorite "beauty guru" on YouTube? If so, who is it and what makes them so special? If you have a beauty Instagram account, what is your favorite and least favorite thing about Instagram's beauty community? What specific makeup item do you find yourself reaching for the most often? I really did have a ball with this award/tag! I thought it was such fun and I do think it is a really good way to put yourself and your blog out there to be seen by fellow bloggers. I would like to believe that we will all take some of our spare time to check out these smaller blogs and to learn a bit about the people that write them. There are infinite possibilities of who and what you will discover because it all links back to other bloggers. There are some real gems out there that really deserve to grow and prosper. I hope you all enjoyed this post as much as I did and I can't wait to see what the future holds...for all of us! REVIEW! Motives Cosmetics "Motives Mavens Element Color Box"
Hi my lovelies! Finally! I have a review on some Motives brand cosmetics! If you aren't familiar with Motives Cosmetics, it is an entire line of skincare and cosmetics by Loren Ridinger. I have been wanting to try Motives Cosmetics for some time now, but just hadn't purchased anything. However, when I saw the shadow collection in the "Elements Color Box", which was created with the input of some extremely talented and successful makeup artists, dubbed the "Motives Mavens", I HAD to have it. The colors just screamed "BUY ME!" If you aren't familiar with who the "Motives Mavens" are, you can find their work on Instagram and other social media. (Very talented ladies, all of them! I will list their names and IG accounts at the end of this post so you can check out their Instagram pages and check their bios for other social media sites they may have.) I purchased this palette with my own money, and as always, I will give you my honest opinion and share my personal experience with the product(s). This is a view of the palette from the outside and the shadows inside. The palette retails for $35.00 on www.motivescosmetics.com. ** The packaging is a highly reflective black plastic that has a click type closure (no magnet). Inside there is a very large mirror that takes up the entire inside of the lid. There are eight shadows, each with 3.54 grams of product and total product weight in the palette is 28.35 grams. (For comparison, a MAC single shadow pan contains 1.5 grams of product.) 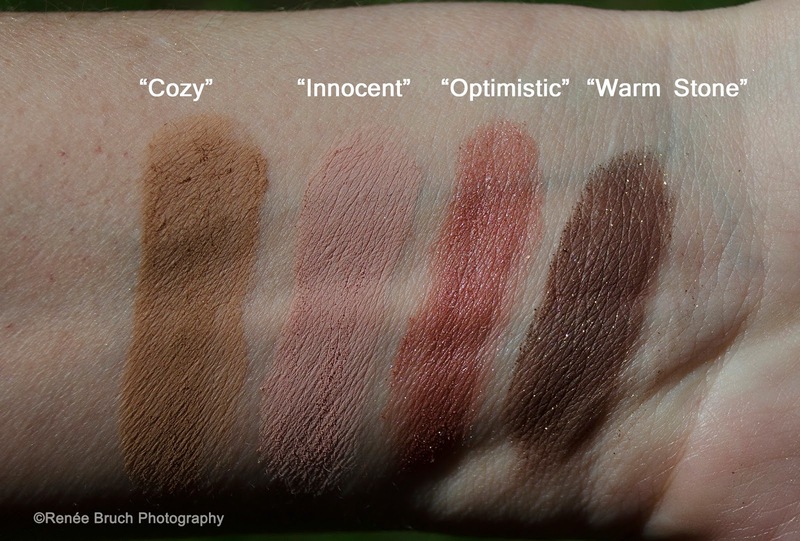 Below are swatches and descriptions of each of the shades. As you may have guessed, "Bordeaux" is my favorite color. Those of you that follow me know I LOVE my burgundy shades! The colors are all extremely pigmented. Some may tend to swatch a bit chalky and seem powdery when you put a brush to it, but there is little (if any) fallout as long as you tap off your brush. The shadows are very high quality and blend out very easily. They are very long wearing (I used a primer) and didn't smudge or fade at all. The shade range that has been chosen for this palette is as close to perfect as you can get in my opinion. 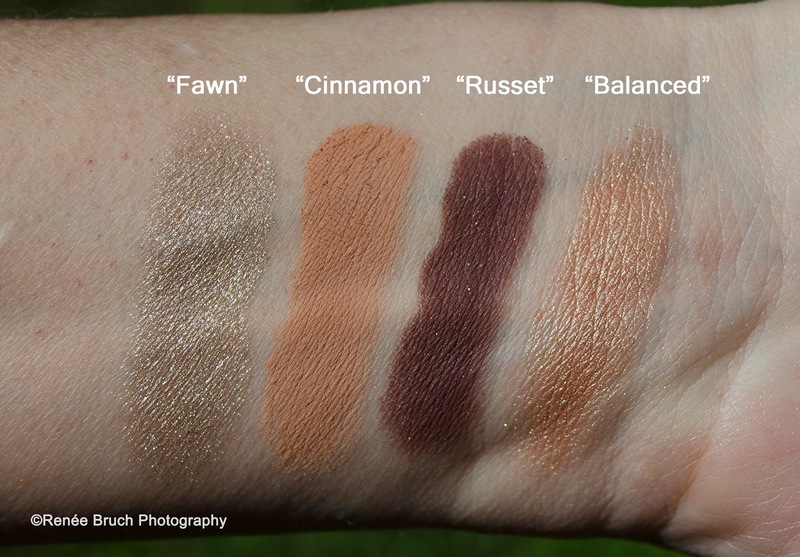 There is just the right of amount of matte and shimmer, and the shade selection is unique enough that you can get a variety of looks from just these 8 shadows. As soon as I laid eyes on the "Bordeaux" color...I knew I had to do a deep smoky look! Below is the look I came up with for this post. I used "Bordeaux" on the inner and outer third of my lid and used a mix of "Shell" and "Serene" right on the center of my lid. Transition shade is "Native". 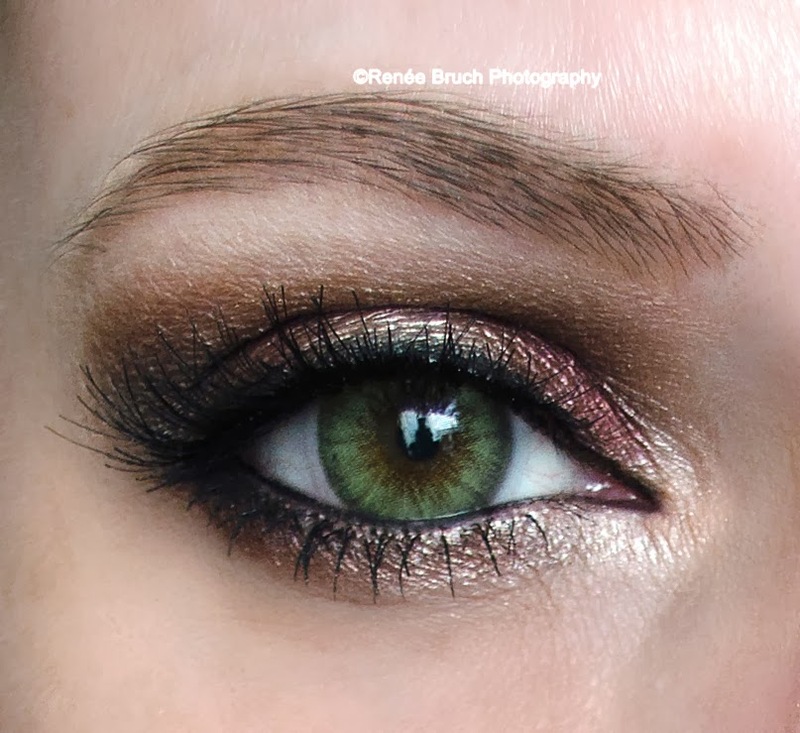 I deepened up the outer corner with "Raven" and I used a small blending brush and blended "Serene" and a touch of "Bordeaux" around the border of "Native" to give a bit of a glowing "halo" effect around the transition shade. For a brow highlight I used "Birch" and my inner corner highlight is "Shell". Under the lashline I used "Raven" on the outer third, "Serene" in the center and "Shell" towards the inner corner. I smoked out all of the shades using "Bordeaux" lightly all over the lower lashline. I am loving this palette! The price is very reasonable for the amount of product you get, the quality is superb and the color selection is on point! I would highly recommend this palette if you are looking to try any of Motives' products and aren't sure what your first purchase should be! I look forward to trying more of Motives' products in the future. And when I do, I will be sure to keep you all in the loop! As promised, below is a list of the "Motives Mavens"* and their Instagram accounts so you can check out their beautiful work! That's all for now my lovelies! I hope you found this post helpful! Please subscribe to my blog on Google+ and comment! I welcome all of your feedback! Follow me on Instagram @reneebruch and on Twitter @ReneeBruchPhoto. Please visit my official website at www.reneebruch.com and like my Facebook page at www.Facebook.com/ReneeBruchPhotography. GIVEAWAY! Too Faced "Chocolate Bar" and Ulta Gift Card! Hi everyone! Yes...it's that time! Another giveaway! Yay!!! I am doing things a bit differently for this giveaway as one of the requirements for entering is that you be following my blog on Google+ in addition to following me on Instagram. (If you have a YouTube channel of your own, or comment on YouTube videos...you have a Google account! And if for some reason you don't, it's super simple to set up. Just do a Google search on how to set up a Google account.) Please read the rules carefully so you don't miss any steps! I want everyone to be able to have a chance to win! And just so it's clear: In order to be entered into this giveaway, you must be following my blog on Google+, as well as following my Instagram account @reneebruch. I will put the rules in this post as well. Keep in mind, if you are already a follower of my blog...you ARE NOT automatically entered into the giveaway. You still have to complete all of the required steps to enter. There will be only one lucky winner. The winner will receive the highly sought after and raved about Too Faced "Chocolate Bar" eyeshadow palette. The winner will also receive a $50.00 gift card from Ulta. I decided that a gift card from Ulta would be an excellent prize because it can be used in store or online. And, instead of me picking out all of the items, the winner could choose exactly what they want or need! And with Ulta having both high end and drugstore brands, there are so many options! Approximate retail value $99.00. 1. You must follow my Instagram account @reneebruch. 2. 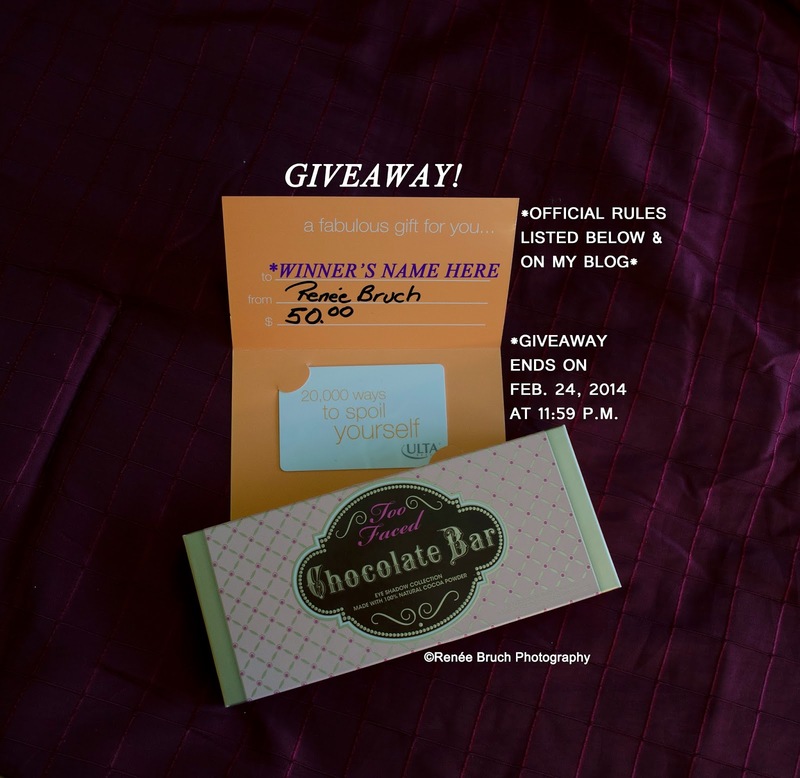 Like and repost the giveaway photo using the hashtag #reneebruchchocolatebargiveaway. 5. Comment on this blog post titled "Giveaway! Too Faced "Chocolate Bar"and Ulta Gift Card!" and provide your Instagram @ account name. I must have your IG account name so I can verify and approve your entry. (You can comment publicly or privately). **Even if you are already a blog follower, you must complete every step of the entry process in order for me to verify your entry. Your entry is valid once I've "liked" your reposted picture on the hashtag page and responded to your comment on this blog post. NO SPAM OR GIVEAWAY ACCOUNTS! If you follow then unfollow, you will be blocked and ineligible for future giveaways. Failure to follow all entry rules will result in an invalid entry. Account must be public prior to end of giveaway. Giveaway ends on February 24, 2014 at 11:59 p.m. Winner chosen at random via Random.org. Winner will be announced February 26, 2014. Winner will have 24 hours to respond or a new winner will be randomly selected. Odds of winning dependent upon number of valid entries. *Your e-mail address, personal information, etc. will not be made public, sold or used for promotional or spamming purposes. I want to thank all of my followers for being so supportive. It means so much to me that you all take the time to give me feedback on Instagram and here on my blog and this giveaway is just a small way for me to say that I appreciate each and every one of you. Good luck to everyone! Please visit my official website at www.reneebruch.com and also "like" my Facebook page at www.Facebook.com/ReneeBruchPhotography. You can follow me on Instagram @reneebruch and on Twitter @ReneeBruchPhoto. REVIEW! Sigma Warm Neutrals Palette! Hi everyone! Today I’m going to be doing a review on an eyeshadow palette from Sigma. It is the “Warm Neutrals” palette. It is a part of their “Enlight” collection (the entire collection can be purchased on their website at www.sigmabeauty.com for $165.00) however, you can purchase all of the items in the collection individually. I purchased these products with my own money and as always, I will give you an honest review and my opinions on these products. The palette costs $39.00 and there are 12 shades that work beautifully together to create a variety of looks. 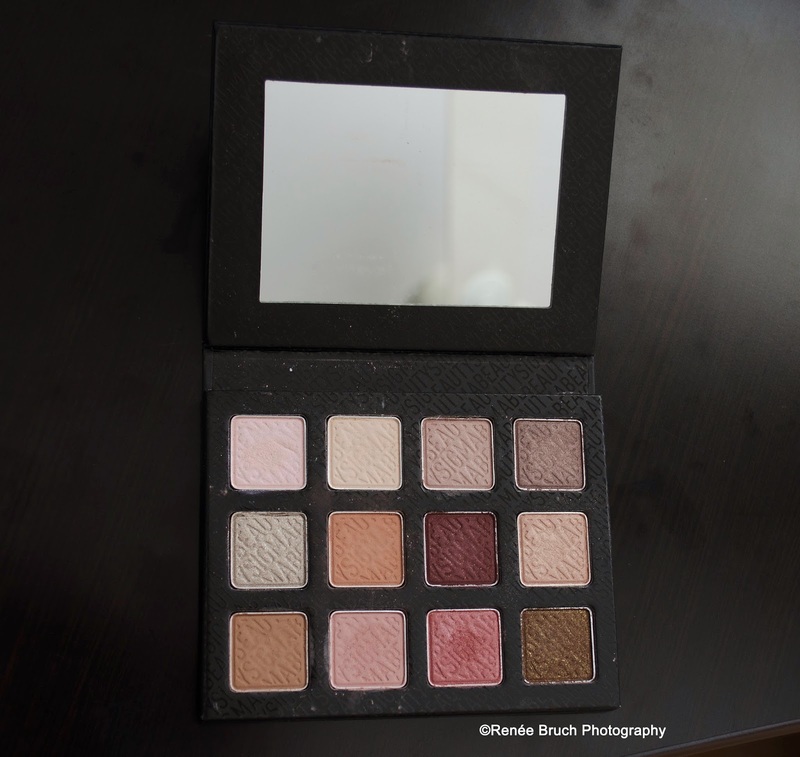 The palette is black, has a magnetic closure and has a decent sized mirror. The shades range in finishes from matte to shimmers, and some are slightly metallic. They are all very pigmented, have a smooth, buttery texture, blend like a dream and none of the shades swatched chalky or powdery at all. 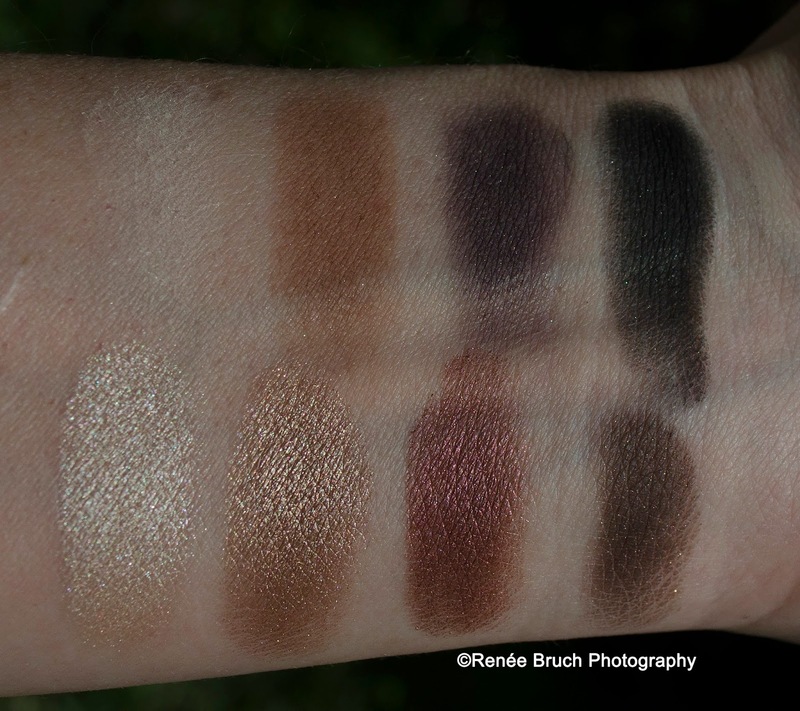 Below are photographs of the swatches taken in natural sunlight. “Oyster Sand” – a very light pink with microshimmer and a slight shift to a soft purple color. “Sugar Milk” – matte cream that is very close to my natural skin tone. Perfect as a highlight. “Russet” – deep jewel toned burgundy with microshimmer (the shimmer doesn’t really transfer to the eye and comes off more matte) My favorite color in the palette! I did a very soft pinky/purple, “barely there” look with the palette for this post. (I also created deep jewel toned smoky eye using another part of the “Enlight” collection, which is the eyeshadow base in “Composed”. You can view that photo on my Instagram page @reneebruch. The eyeshadow base cost $13.00 and is a warm but soft brown with a slight sheen. ) Below is a photo of my “barely there” look I created for this post. To achieve this very soft, “barely there” look, I first used a shimmery deep purple Extended Wear pencil eyeliner in "Declare" ($7.50 on Sigma’s website - it is at a discounted price) and messily lined my upper lashline and slightly smudged the color upwards. I used “Oyster Sand” all over the lid to give a very slight wash of shimmer. It doesn’t really show too much on the lid, which is exactly what I was going for because it let my natural skin tone show through with a very light pink shimmer that caught the light beautifully. I used a slight amount of “Optimistic” on the outer corner of my lid avoiding the crease. 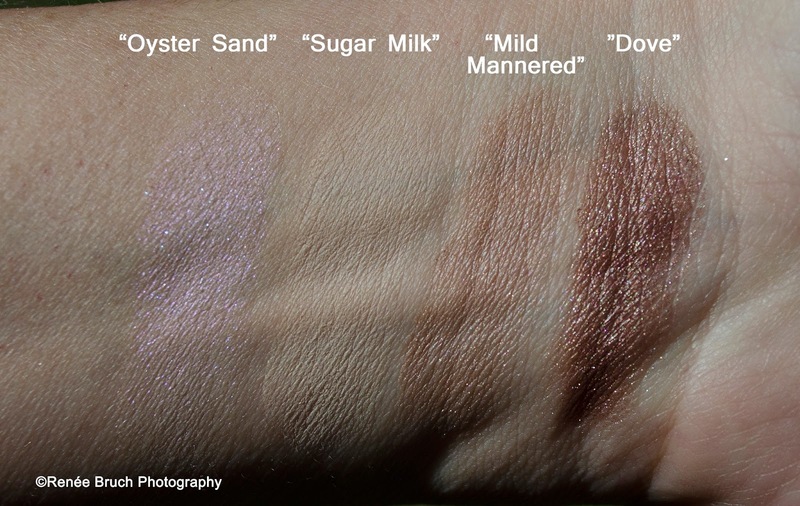 I blended this shade out very lightly to keep the soft wash of color and sheen from “Oyster Sand” on the lid. I used “Cinnamon” with a very light hand as a transition shade and into my crease. “Sugar Milk” was used as my highlight. I took the pencil liner to lightly line my lower lashline and smudged it out with “Oyster Sand” and also used that same shimmery pink shade as an inner corner highlight. I mixed a tiny bit of “Cinnamon” with “Optimistic” and smudged that onto the outer 1/3 of my lower lashline for a bit more definition. A few coats of mascara finished off the look. I loved the way this came out because it was so very soft and pretty and not an “in your face” pink look. I think that this palette has a great color selection and you can achieve a wide variety of looks, which will take you from Winter right into Spring. I am glad I spent the $39.00 for this palette! It has been my go-to palette for January and I’ve come up with a completely different look each time I’ve used it. In my opinion, this is a great palette and I would highly recommend it to anyone looking for a neutral palette that has some lovely bronzy shades with some pops of unique colors! Visit Sigma’s website at www.sigmabeauty.com to view the entire “Enlight” collection. Each of the items in the collection can be purchased separately. And don’t forget to check my Instagram account for the jewel toned smoky eye I created so you can see how the palette can take you from a “barely there” look to a deep, sultry look. Thank you all so much and I’ll see again soon!!! !